At the Museum of World Treasures, we want to cultivate a culture of giving back. At a recent staff meeting, the idea of giving back or volunteering as a collective group came up for discussion. What emerged was quite impressive. "I volunteer 10-12 hours a week to help women get out of dangerous domestic abuse situations." "I spend time on weekends tutoring children via a program through my church." "I donate my time to raise money for severely wounded veterans." Steven King, Curator of Collections and Staff Paleontologist, worked with his family to support Operation Christmas Child, a project of Samaritan's Purse. By collecting much-needed toiletries and daily necessities that we often take for granted, King's family undoubtedly impacted the life of a young child. he created for the event. 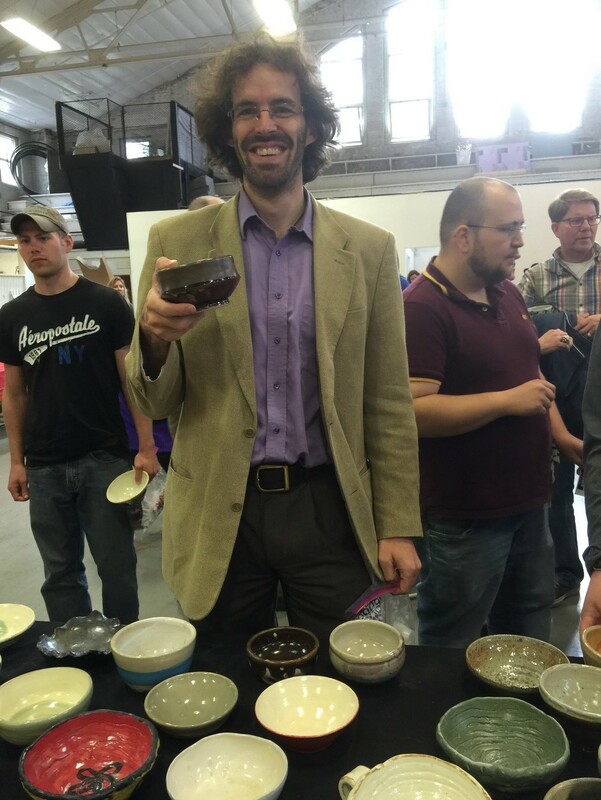 Tim Howard, Curator of Exhibits and Research, supported the Kansas Food Bank’s Empty Bowls Chili Cook-Off by working with the WSU Ceramics Guild to create bowls to use for the event. This event, held in collaboration with the WSU Ceramics Guild, WSU Hunger Awareness Initiative, and the Elliott School of Communication, was organized to honor Hunger Awareness Month. There was also a raffle and silent auction to raise funds and all donations went to the Kansas Food Bank. rest of the DiRT team. 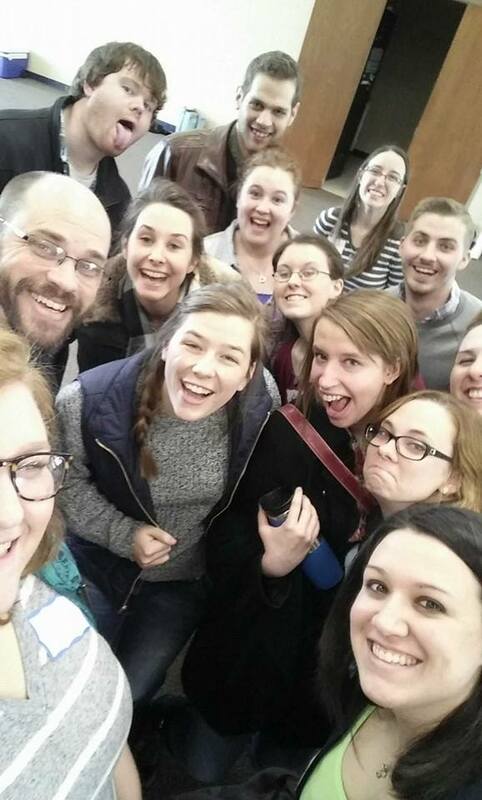 Kristin Martin, Education Director, volunteers as part of the DiRT Team (Diocesan Retreat Team) for the Catholic Diocese of Wichita. The DiRT team is comprised of college students and young adults who lead small group discussion, reflection, prayer, and presentations during retreats which prepare middle school and high school students for the sacrament of confirmation. events at local pet supply stores. Jordan Page, Marketing Assistant, donates her time to help homeless cats and dogs find homes through Wichita Animal Action League (WAAL). In addition to marketing the animal rescue group through social media and other marketing avenues, she also volunteers at local adoption events to help these animals find their forever homes. The list goes on, but this really got us thinking about what all of our volunteers do for the Museum. Last month, we had two volunteers show up to work an event who really shouldn’t have been out of bed. Ron Bogard had just had gall bladder surgery the day before, and Jim Finneran had such a bad back issue that night that we weren't certain if we should get him a chair or take him to the emergency room. We know you are all cut from the same cloth as our staff and our volunteers. You volunteer to coach your kid’s soccer team because if you didn’t, there would be no team. You buy every raffle ticket, every popcorn bag, and every cookie box because you know that young children are benefiting from those donations even if you don’t always see the direct result—besides an increased waistline post cookie influx! Here at the Museum of World Treasures, you can see your donations directly giving back to the community--especially our youngest citizens. For example, we are seeing a trend towards fewer and fewer school field trips as schools are forced to cut these "luxuries" due to budget pressures. In 2014, the Museum served over 5,900 children via school field trips. For 2015, that number is down to less than 4,600 children. With your $60 donation, we can bring in 10 children. Without it, 10 children won’t see Ivan in all his T. rex glory. They won’t hear about the tale of Clarence the Crusader or gaze upon our 1843 print of the Declaration of Independence. Without you, these field trips become impossible. What impact can a field trip make? Just the other day, Travis, a student at Missouri Western, contacted the Museum requesting some information about getting into the museum profession. Growing up in Derby, he still regarded the Museum of World Treasures as one of his favorite childhood memories. Clearly, the Museum of World Treasures has a lasting impact. So, as we approach #GivingTuesday this year, we are asking you to consider the Museum of World Treasures as the one place where you can give back to the community to see first-hand the impact that your donation can make. Pair up with a friend to each give $60 dollars and help us bring in 20 more children to experience a world of treasures. Tomorrow is the day! Let’s see how big we can make #GivingTuesday for #MOWT. Giving just $60 or 60-minutes of your time will bring us one step closer to educating, entertaining, and inspiring lifelong learning for everyone! If you are interested in learning more about supporting the Museum please visit our website or call us at 316.263.1311.